To set up an online class for assignments to give your students, go to https://www.edmodo.com/. It’s free! http://www.procon.org/ This is a wonderful resource for students who need practice writing argumentative essays for the high school equivalency test. It contains the pros and cons on a wide array of topics. https://newsela.com/ This is a great site for nonfictional texts on a wide variety of subjects including social studies, science, politics, and literature. Each text is written at four different reading levels so low-level to advanced students can use this material. Some of the stories contain quizzes or writing assignments. The high school equivalency test emphasizes nonfictional texts so this is a good resource for students and tutors. http://www.hippocampus.org/ Students who need to learn background knowledge in science, math, social studies, etc. can watch a wide variety of videos on this site. http://nextgenscience.org/ Includes K-12 science content standards, classroom sample tasks and lessons in science. http://www.acces.nysed.gov/what-hsetasc-test New York State Education Dept. –Adult Education—TASC Exam; Find education and Examiner Resources; TASC Test Taker Resources and general information about the TASC exam. https://www.wyzant.com/resources/lessons Lessons in all subject areas; sharpen your skills with these interactive lessons. http://www.tasctest.com/ TASC Test Assessing Secondary Completion; TASC Test All-In-One Resource Hub. http://www.collectedny.org/ Resources for New York State educators preparing adult students for high school equivalency and beyond. https://www.ck12.org/teacher/ Math, Science (including simulations), English, History, Health and more. Can be used in either teacher or student versions. Need to join. http://www.math-aids.com/ Dynamically created math worksheets. https://www.khanacademy.org/ Helps students to understand the concepts and when they just need help with the “nitty gritty”. Focus on math computing, science, and history. https://www.easyteacherworksheets.com/math.html Truly a plethora of free worksheets and answer keys in all area of math. http://www.youtube.com/watch?v=-i1R3gNlFUQ Videos of volunteers tutoring students. http://www.ncsall.net/fileadmin/resources/teach/uwriaa.pdf Contains great tutoring tips and ideas for teaching reading skills. http://lincs.ed.gov You can search for free, online resources or free online courses to learn new teaching skills. www.repeatafterus.com This site contains numerous recordings of famous texts. Students can see the text while listening to it. http://www.litworks.org/teaching_adults.html Contains a list of useful links for tutors. http://www.tv411.org This site has videos on reading, writing, math and science. ttp://www.spellingcity.com/ A research-based vocabulary supplement providing the tools and training for vocabulary building and retention. Engaging activities allow students to read, hear, speak, write, and break down words and sentences. https://www.procon.org/ Current relevant and controversial topics to write about. https://newsela.com/ Makes current events accessible to every reader, instead of a one-size fits-all approach. Offers the same article at different reading levels. https://www.readworks.org/ ReadWorks provides the largest, highest-quality library of curated nonfiction and literary articles in the country, along with reading comprehension and vocabulary lessons, formative assessments, and teacher guidance. http://www.ldonline.org/ This is an excellent resource for information about learning disabilities. http://learnzillion.com This site contains videos and lesson plans for math, reading and writing. https://www.uscis.gov/citizenship/teachers/training-and-professional-development/volunteer-training Adult Citizenship Strategies for Volunteers; from the USCIS website; 8 modules to help you guide your learner through the naturalization process. https://mnliteracy.org/curriculum-lesson-plans Minnesota Literacy Council has Curriculum Units for pre-beginning and beginning ESL students. http://mnliteracy.org/tools/ESLPull-OutKits Minnesota Literacy Council ESL Pull-Out Kits with ready to use lessons and activities in pdf format for download. https://www.eslbuzz.com/list-of-words-with-11-silent-letters-in-english/ List of English words with silent letters; includes colorful graphic chart and lists. http://www.elllo.org/ Learn English with free video and audio lessons. http://www.freerice.com/ Freerice is a 100% non-profit website that is owned by and supports the United Nations World Food Programme. Freerice helps to end world hunger by providing rice to hungry people for free while helping to build your vocabulary. https://itunes.apple.com/us/developer/hello-hello/id371655433 or https://play.google.com/store/apps/developer?id=Hello-Hello&hl=en Learn a new language anytime, anywhere with this free app. https://play.google.com/store/apps/detailsid=com.macmillan.app.soundsfree&hl=en The ultimate mobile English pronunciation aid, for both students AND teachers. Sounds: The Pronunciation App helps you study, practice and play with pronunciation wherever you are. This free version includes Interactive Phonemic Charts for British English and American English. Tap to hear a sound, or tap and hold to hear the sound and an example word. https://www.newsinlevels.com/ World news for ESL students. Articles are available in three levels. http://oercommons.org The project has also identified and reviewed many open educational resources (OER) that are appropriate for use in the adult ESL classroom, which can be accessed by going to the Adult Education Open Community of Resources on OER Commons, then clicking on the “Adult ESL” shared folder. http://breakingnewsenglish.com Interactive site with printable lessons in 7 levels. https://www.uscis.gov/citizenship Site for learners and teachers with a one-stop resource for locating citizenship preparation materials and activities. http://grammar-monster.com/ Grammar lessons, notes, and quizzes. http://www.grammar-express.com/grammarup/ Grammar Up (ISO app) is a multiple choice quiz system for English which provides over 1800 questions across 20 grammar categories. Grammar Up was designed to replicate questions with a business focus commonly found in the popular TOEIC (TM) English proficiency test. Grammar Up can help learners to improve their grammar, word selection and vocabulary. https://lincs.ed.gov/state-resources/federal-initiatives/ell-u LINCS provides adult educators with the information, resources, professional development activities, and an online network adult educators need to enhance their practice and ensure their adult students receive high-quality learning opportunities. https://kahoot.com/ Create learning games to reinforce knowledge, recap learning, and pre-assess and practice concepts. Players answer the questions on their own devices, while games are displayed on a shared screen to unite the lesson. Besides creating your own kahoots, you can search among millions of existing games. https://quizlet.com/ Search millions of study sets or create your own. Improve your grades by studying with flashcards, games, and more. The Art Project is a unique collaboration with some of the world’s most acclaimed art institutions to enable people to discover and view artworks online in extraordinary detail. http://www.learnhowtobecome.org/ Online resources to help find your career. Includes a “Get Hired Toolkit”, Career Resources, College Career Programs Search, and more. http://learn.genetics.utah.edu/ Genetic Science Learning Center. Includes many tools including virtual labs. https://www.loc.gov/ Primary source documents and lesson plans. https://www.sporcle.com/ Choose from a bank or quizzes or create your own. Includes “Hot Quizzes Trending Now” section. http://www.thefreedictionary.com/ The world’s most comprehensive dictionary. Includes thesaurus, acronyms, abbreviations, idioms, encyclopedia, and a literature reference library. http://www.readwritethink.org/ Lesson, interactives, strategy guides, graphic organizers and more. https://portaportal.com/ Store your bookmarks on the web for easy access anywhere. http://library.universalclass.com/index.htm Over 500 online courses in ESOL, Math, Reading, and more; for learners and tutors. http://www.gcflearnfree.org Online repository of free courses from learning computers to using Microsoft office. http://www.typing-lessons.org/ Free online typing lessons in a simple format. http://www.proliteracyednet.org Online learning for instructors and 0ver 500 online courses in ESOL. There are numerous lesson plans with reading material and activities for tutors. Students have the option of listening to a recording of the stories. 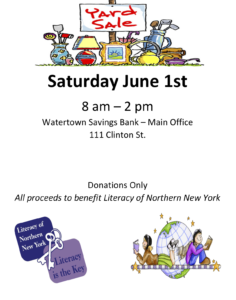 Literacy of NNY accepts donations securely through PayPal. Check out LNNY on Facebook!